The themes that were painted ranged from mythology to literature and brought new techniques to the fore. 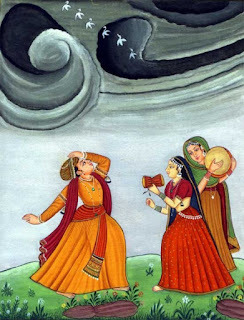 A typical Pahari painting would bring several figures into the canvas and they would all be full of movement. Each figure is different in composition, colour and pigmentation. Two of the greatest figures of this school are Nainsukh and Manaku. After the decline of the Mughal Empire, many artists trained in the Mughal style migrated to the Kangra region as they got patronage by Raja Goverdhan Singh in 1774. It led to the birth of Guler Kangra School of paintings. It first evolved in Guler then came to Kangra. This school reached its zenith under the patronage of Raja Sansar Chand. His paintings were marked with a sensuality and intelligence that the other schools lack. The most popular subjects were the Gita Govinda, Bhagwata Purana, Satsai of Biharilal and Nal Damyanti. All the paintings had an other worldly feel about them. Another very famous group of paintings is the “Twelve months” where the artist tried to bring forth the effect of the twelve months on the emotions of human beings. This emotive style was popular of the 19th century. The Kangra School became the parent school to the other ateliers which developed in the court of Kullu, Chamba and Mandi. The paintings created in the Pahari School in the 17th century were called the Basholi School. This was the early phase and expressive faces with a receding hairline and big eyes that are shaped like lotus petals characterize it. These paintings use a lot of primary colours, i.e., red, yellow and green. They used the Mughal technique of painting on clothing but developed their own styles and techniques. The first patron of this school was Raja Kirpal Singh who ordered the illustration of Bhanudatta’s Rasmajari, Gita Govinda and the Ramayana drawings. The most famous painter of this school was Devi Das who was famous for his depiction of Radha Krishna and the portrait of kings in their livery and in white garments. The contrast of colors in associated with this school and they stylistically borrowed from the Malwa paintings. sir can u plzz tell which book to read regarding mahatma ganghi,s teaching for naib tehsildaar? ?